California will return to requiring state workers to take unpaid days off in an attempt to deal with the state's severe budget crisis. The state may also start issuing IOU's as the state's controller estimates that California could run out of cash by October. See the following post from The Mess That Greenspan Made. 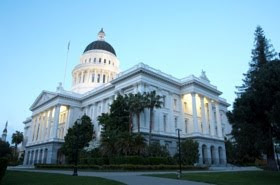 The Sacramento Bee reports on the latest developments in the 2010 edition of the California Budget Crisis, what looks to be the worst episode yet unless help arrives from Washington. Less than a month after ending unpaid days off for more than 200,000 state workers, Gov. Arnold Schwarzenegger is bringing back a scaled-down version of the policy that will take effect on Sunday. The governor made the decision this week after Controller John Chiang said that until lawmakers come up with a budget, he’ll start issuing IOUs in August or September to conserve funds as long as possible. The state’s cash could run out by October, the controller estimated. The last furlough program ended on June 30th, so, state workers will likely see just one full-size paycheck before reverting back to a roughly 15 percent pay cut as a result of being forced to take three days off without pay each month. Complaints are already coming in that the selective nature of these furloughs – exempting groups such as police, fire fighters, and tax collection agencies – isn’t fair. Gov. Arnold Schwarzenegger’s Wednesday furlough order did something different: It picked winners and losers. True, his earlier furloughs and this one exempt the Department of Forestry and Fire Protection and the California Highway Patrol. Schwarzenegger considers them key public safety organizations and didn’t want to dilute their resources. But his new order exempts six other departments. That’s significant because the governor has always said that, to be fair, furloughs should be applied across the board. Let’s list them, and look at why they’re furlough-free. Tax collectors: The Franchise Tax Board and the Board of Equalization are California’s big money rakers. According to a study by the Senate Office of Oversight and Outcomes, furloughs at FTB cost $7 in lost revenue for every $1 in payroll savings. Money conduit: The Employment Development Department is a funnel for federal dollars flowing to more than 2 million unemployed Californians. Demand for EDD services has been at a record high, so the department went on a hiring binge while paying overtime to claims processors. Untouchables: A rationale for prior across-the-board furloughs has been that even departments that get little or no money from the general fund still need to run lean. That way there’s more cash for the general fund, the center of the budget mess, to borrow. The state legislature comes back from their August recess next week and, like the last few summers, the budget crisis should start heating up shortly thereafter with more IOUs likely to be issued in the fall.